Eliza Encheva is a former member of the Environment & Society Portal team and holds a master’s degree in English, Spanish, and German Literary Studies from LMU Munich, Germany. Charles Eisenstein is a philosopher, author, and public speaker living in the USA. Created by Eliza Encheva (2013). Your writings and lectures resonate deeply with my own experience. By expressing your thoughts in a simple yet beautiful way, you manage to share a story that we “have heard and want to hear again” and that we “can enter anywhere and inhabit comfortably” (quote on the nature of great stories from Arundhati Roy’s novel The God of Small Things). I am writing to you in an attempt to make sense of the transition that so-called western societies are undergoing at this moment. It seems to me that the current crisis is not only ecological or economic but ultimately also a crisis of the mind, which calls for a reinvention of ourselves, or in other words, a new story of self. In the talks you give around the world, you often speak about the “old story” that is based on the scientific “myth” separating ourselves from each other while subjecting us to the impersonal forces of an external universe. Your latest book, The More Beautiful World Our Hearts Know Is Possible, deals with this “Story of Separation” as the primal cause for hopelessness, impotence, and despair. In a universe of separate selves, hardly anything one does is of great importance unless one exercises a great amount of force, for example with the help of money and the power that comes with it. Facing the overwhelming effects of global ecological and financial crises, individuals and their actions seem to matter only marginally. If we are highly idealistic, we might set out to accomplish “big” things—writing books, fighting for peace and social and ecological justice in war-torn regions, or trying to stop deforestation. Most of these individual efforts, however, are bound to fail since they tackle mainly the symptoms rather than the roots of the problems. In the face of this I would like to point to a sign of hope: Some of the declarations of Pope Francis and his sharp critique of the capitalist system, combined with his acts of humility, like driving an old car and giving up the papal residence, strike a chord with me. Pope Francis, it seems to me, is not just giving new options but is telling a new story. In doing so, he reminds me that anyone can be a such a much needed storyteller, a shepherd to guide us through times of transformation. Even though I sometimes wonder whether words are enough to ignite the transition we need, or whether we are able to manifest this new reality by using a new language, I am inclined to believe that words provide a good starting point, no matter how limited our language and thus our construction of social reality is. They invite us to question what feels right, and equip us with new means to express ourselves in times of rapid transformations. The following serves as an illustrative example. Each year thousands of people gather in the bleak and hostile lands of Nevada’s Black Rock Desert at an event called Burning Man, which goes beyond common labels like “transformational festival,” “art event,” “temporary city,” or “experiment in radical self-reliance.” Burning Man stands for the end and the beginning of man, for the cycles of nature and human civilizations. These cycles come and go, just like the Burners—or Burning Man’s citizens, as the event’s participants are called—who erect a city in the middle of nowhere and leave the desert a week later almost without a trace. Black Rock City, as the Burners call the festival site, is a microcosm of its own, a utopian vision of a society, which almost magically turns into reality at the end of August. While it is a celebration of love and joy of life, its citizens celebrate its principle of radical inclusion also by embracing facets of self-expression. Each year a different work of art functions as Burning Man’s Temple. The Temple provides a place for grief and commemoration, with little altars or caves for Burners to leave remembrances of their lost ones. Even the construction of the Temple can be a process of deep emotional transformation for the people who build it in service to the whole community and also as part of their own process of grieving and letting go. The burning of the Temple at the end of the event, then, just like the burning of a large wooden effigy symbolizing “the Man,” appears to be a sacrifice and a rite of passage. Its catharctic effect on Burners has been described by many as an overwhelming feeling of release. I feel that this process of renewal, of “sacrificing”, and stepping into a new story of self, is much needed on a global scale. The challenge of our age is both learning how to die, as the Iraq war veteran Roy Scanton puts it, and at the same time remembering how to live, as Ian MacKenzie, the director of the poetic short film about the guardians of the Temple, attempts to remind us. Both learning how to die and remembering how to live are part of the same story. They are essentially one and the same, just as giving and receiving are two sides of the same coin. 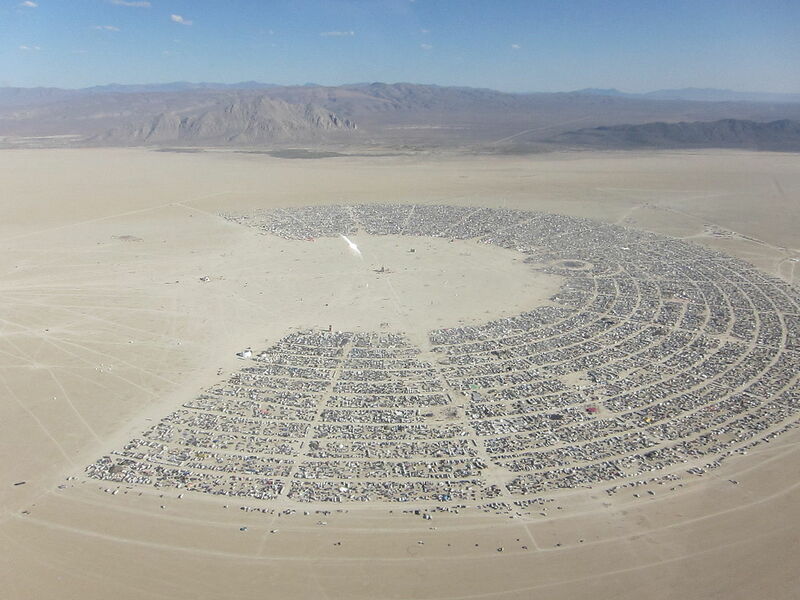 Burning Man is not a solitary manifestation of a new vision of self and society. Examples of communal self-organization abound in the form of ecovillages, other transformational festivals, Transition Towns, guerilla gardening initiatives, alternative media outlets, activities by the Reclaim the Streets and the [freespace] movements, unconferences, Random Hacks of Kindness events, or other forms of civic hacking that help “deprogram” societal and mental structures. Many of these events and activities share Burning Man’s radically participatory ethic, its principles of decommodification, gifting, radical inclusion, communal effort, civic responsibility, and immediacy. Together with the leave-no-trace principle (which should be expanded to embrace various forms of sustainability), these make up a promising list of guidelines for the society I would love to live in; and it seems as if more and more people around the world are having the same urge. At some point in life, usually after a crisis which shows that you have not been turning your gifts toward their true purpose, this urge becomes unstoppable. It nags us until we finally let go of our habits or modes of thinking; to let go of whatever it is that is confining us to a life of limited freedom or disconnection from the world. When that happens we find ourselves living into what you, Mr. Eisenstein, like to call the “Story of Interbeing” or “the Ecological Age.” It is a story that gives us the feeling of belonging, connectedness and emotional integrity. As I understand it, it is a world(view) in which neither the principles of the feminine and the masculine, nor the states of being and doing are diametrically opposed to each other but rather equally engrained in how we operate as humans. We already live in a world in which kids and teenagers around the world join NGOs to tackle issues like global warming (think of Felix Finkbeiner’s organization Plant for the Planet), young adults team up with scientists and engineers to clean the oceans of plastic (think of Boyan Slat), and former child soldiers start give yoga classes in slums (think of Tambia Fayia), and build schools and educational programs (think of Emmanuel Jal). These individuals channel their pain to create something sustainable that transcends their individual selves. So when Emmanuel Jal raps, “I’m a war child […] I believe I’ve survived / for a reason to tell my story to touch lives,” his story seems to resonate with that of Earth itself. Thank you, Mr. Eisentein, for telling your story. 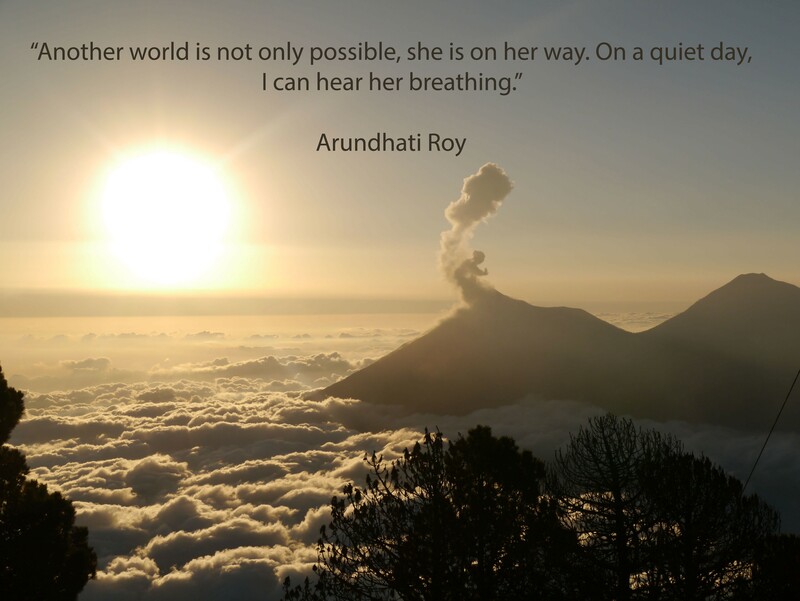 And for reminding us that it may be wiser to not rely solely on our intellect and our capacity for critique, but to listen to our inner voice when it comes to creating the more beautiful world our hearts know is possible. Trailer: ‪“The More Beautiful World Our Hearts Know Is Possible“. Directed by Ian MacKenzie and produced by Sustainable Human.